← Appearing Tomorrow at 1 PM EDT on NuLife Radio! 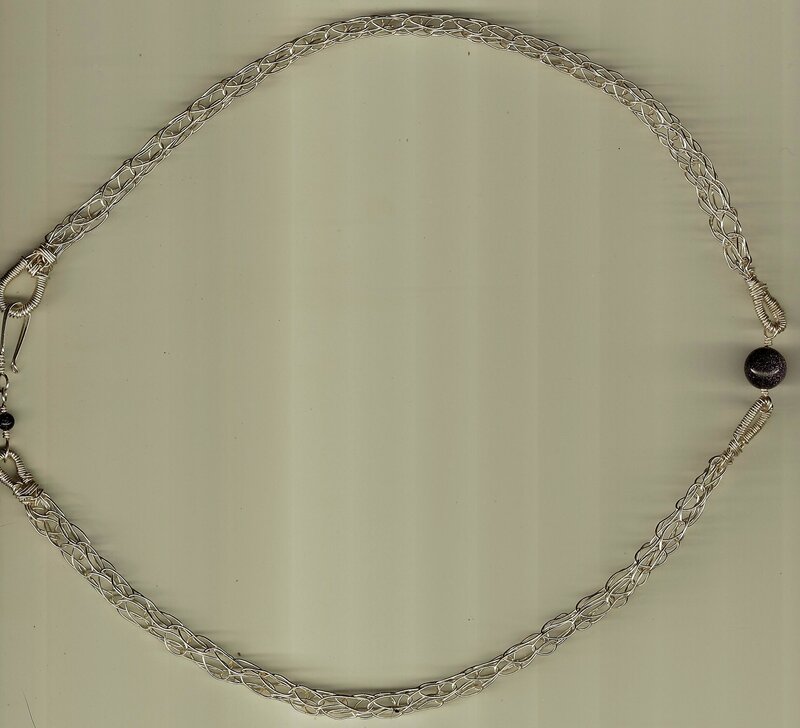 I recently learned how to make Viking Knit Chain Maille. 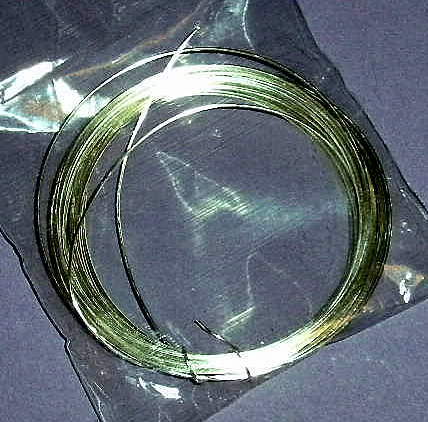 This stuff is very different from the linked rings style that we have become accustomed to seeing in movies and at Renaissance Faires because it’s made of wire that is woven into a long, flexible rope-like structure. I’d been posting photos of the bracelets I’d made, and as I gained practice, they all started looking better and more finished, as is natural. Various people complimented me on the work, and one of them, a particularly favorite online friend named Jason, asked me if I could make him a necklace. He wanted it to be heavier than the delicate work I’d been turning out, because he is a guy, and wanted something suitably masculine, and in scale with his stature and build. I figured I could handle this challenge, and said yes. This is the tale of how it went, and how it came out. 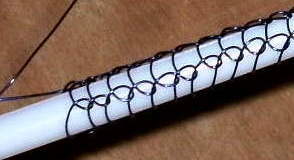 First, I had to choose the correct weight of wire, and for this project I initially choose 22 gauge. 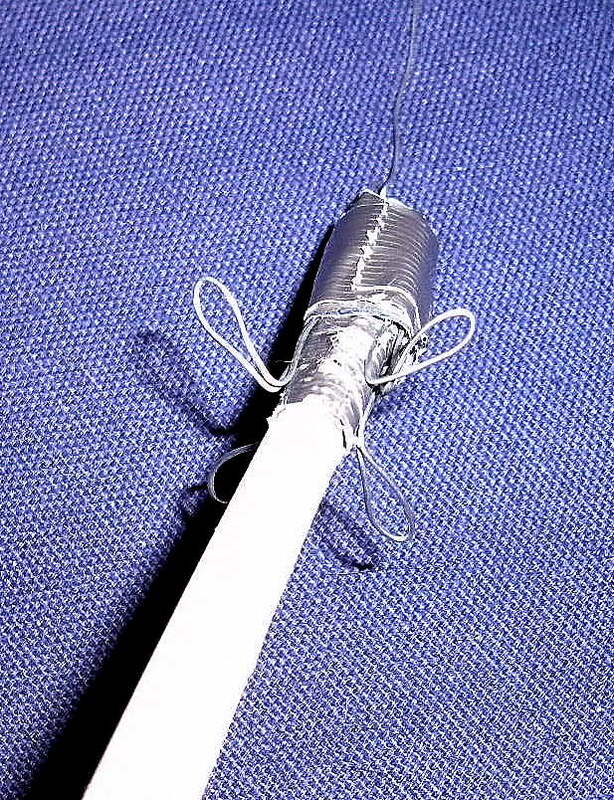 This proved far too heavy, and I wound up changing over to 24 gauge, which is significantly more flexible- but posed a different problem; if I used the lighter gauge wire, the resulting “rope” would be slender and delicate- and that was not what Jason wanted. In order to achieve the chunkier look that would suit him, I would have to increase the “ply” of the weave. Now, when I initially learned this craft, I learned it by watching a video. The demonstrator was selling a tool to make the Maille, and the resulting product had to be cut in order to remove it from the tool. The finished ends looked rough, and as if they might not hold up when subjected to the rigors of being worn. I decided-before even starting my first project, that there had to be a better way! I experimented- first attempting to weave on my fingers, and then using a small ring, and cast off stitches as if I were crocheting. The finished piece was ok, but I was sure I could do better. I then improvised a tool of my own, and it dramatically improved the ease of making the Maille, and also produced a neater, more organized looking end product. Before this, I had used mostly 26 and 28 gauge wires, on the 4 ply tool, and achieved an effect that was somewhere between macrame and basketry. I started this project with 22 gauge, as mentioned before, but this was too heavy and stiff to have the necessary flexibility, so I started over again with 24 gauge, which worked much better. 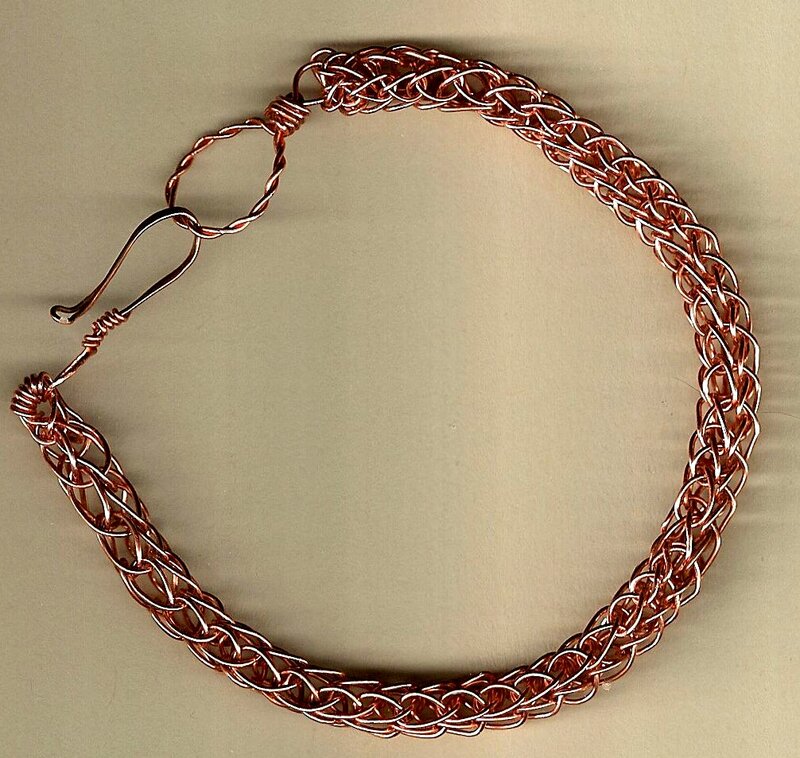 I did my best to anticipate the finished length, though this varies greatly, due to the differences in wire gauge, size and ply of the weaving, and also the thickness of the rod around which it is woven. After the desired length has been completed, the piece is drawn through a drawplate, or other tool with an appropriate sized hole in it. This stretches out the piece, but it also gives it much greater flexibility. The loops at the ends are then drawn together and wrapped with their own ends. 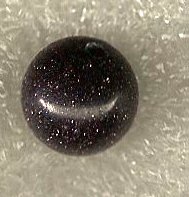 After some discussion, a fairly large focal bead was selected for the center front, made of the gemstone Blue Goldstone, which is actually the only man-made product that is considered a legitimate gemstone. 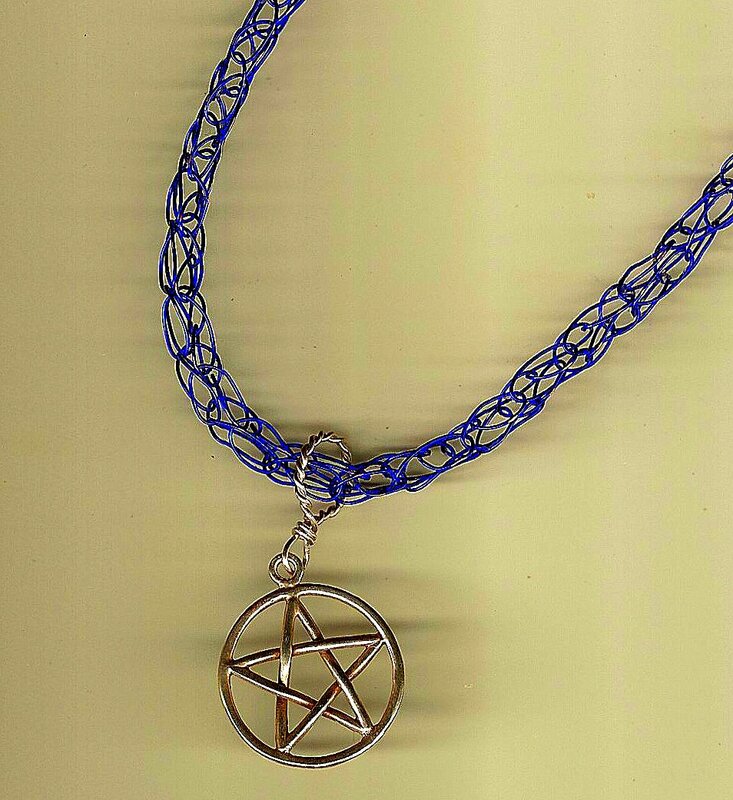 After such a success with Jason’s project, I had enough confidence to accept an order for a very different necklace from another friend, Tidal. Tidal wanted a different kind of necklace, long and slender. 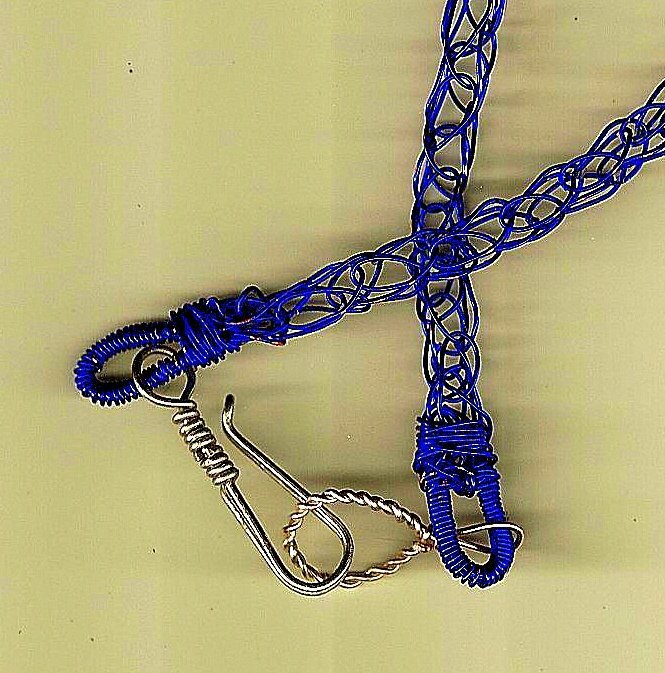 He wanted me to use a deep blue wire that I had found some weeks ago, and sent me a pendant to work with. I threw in an additional experimental bracelet that had come out quite well, and matched the necklace perfectly. Tidal’s necklace was a return to the original 4 ply format, with which I have a bit of experience. 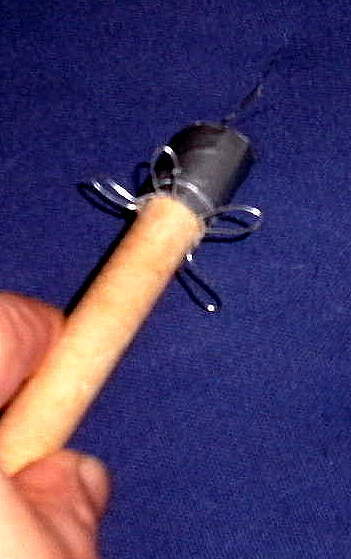 It was a much lighter gauge of wire, so it seemed to go easier- until it wasn’t, and became hopelessly wonky. I had to do it all over again to make it come out right. Make no mistake- long is hard! Wire that is bent and worked repeatedly fatigues and breaks, and I wound up with tiny jabs all over my hands from the sharp ends. I found ways to splice the wires in that don’t show, and thank goodness for that! I drew it out carefully, but some of the blue still scratched off. I tried waxing the channel I drew it through, but it was an imperfect solution. 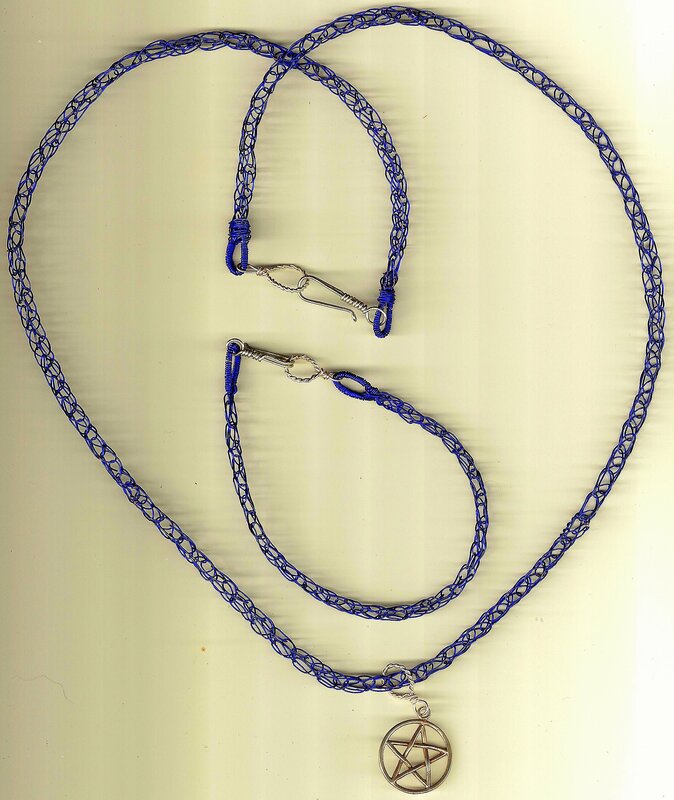 I made the bail for the pendant to match the “eye” of the necklace and bracelet closure. In spite of imperfections, the finished piece is impressive, and has a nice flow to it. It has delicacy as well as texture. Jason’s was the first necklace, the first experiment with five-ply format, and the first piece I’d made with beads. 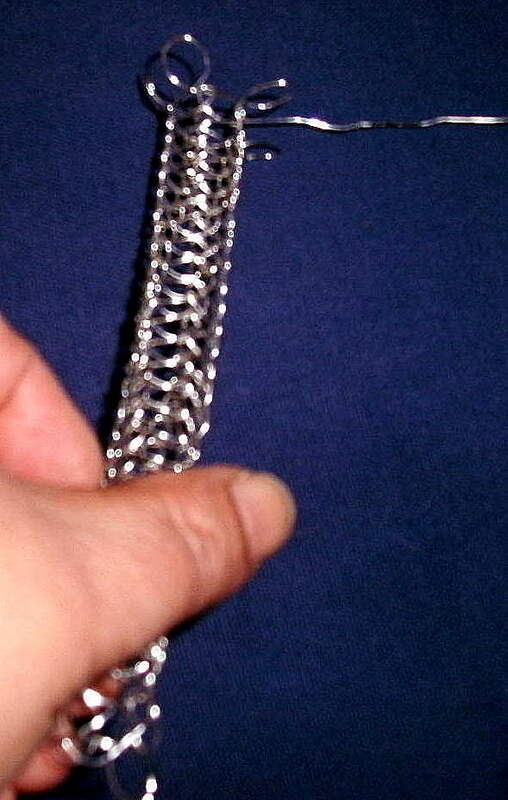 It was also the first piece of Viking Knit Maille that was commissioned. 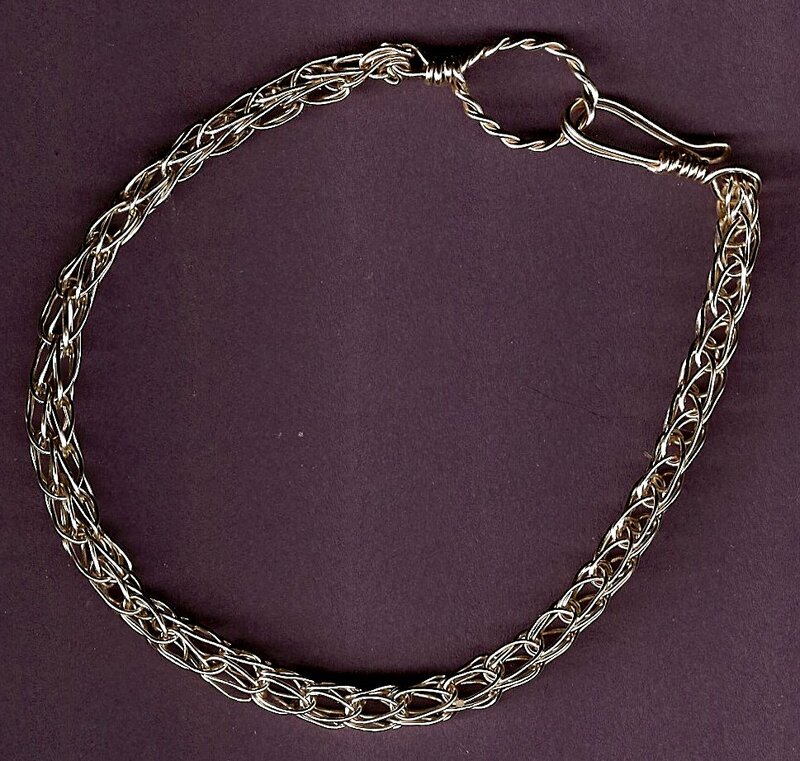 Tidal’s was the first long necklace, the first necklace made of lacquered wire, and the only time a person has ever sent a piece they wanted incorporated into the finished piece. It was an interesting experiment, and the pendant Tidal sent worked perfectly with the design of the necklace. Gallery | This entry was posted in Handcrafting, Metaphysical, skill development, Spiritual, Synergy, tarotcircle and tagged Blue Goldstone, Bracelet, Chain Maille, Draw plate, Energy Jewelry, Knitting with Wire, Necklace, Pendant, Spiritual Art, Viking Crafts, Viking Knit Maille, Viking Maille, Wire, Wire Braiding, Wire gauge, Wire Weaving. Bookmark the permalink.